When a Link Monster’s effect is activated that targets this face-up card on the field (Quick Effect): You can destroy this card, then send 1 monster on the field to the GY. During the End Phase, if this card is in the GY because it was destroyed on the field by battle or card effect and sent there this turn: You can Special Summon 1 “Rokket” monster from your Deck, except “Magnarokket Dragon”. You can only use each effect of “Magnarokket Dragon” once per turn. Magnarokket Dragon is like Autorokket, but for monsters. Link Monster targets Magnarokket, you trade it for a monster on the field. “Send” instead of destroy, avoiding those pesky monsters that trigger effects off destruction and/or are invulnerable to destruction effects. Something I haven’t mentioned in my reviews, you can target your own Rokket monsters with Link Monster effects to trigger their effects. Use your own Borrel monsters to fire off your Rokkets and gain advantage without losing your field presence. Strong ATK stats, Magnarokket is one of the attackers for the archetype. With the Guard Dragon archetype coming to the TCG, this archetype gets more synergy to work with, alongside other Dragon-support cards. Removal of opponent cards is always desired over mere negation. Magnarokket does this and will replace itself for good measure. Magnarokket Dragon reminds me of a Megaman X boss and both are very cool looking. The stats and effects are a little redundant, but this one is arguably the best of the bunch. 1800 Atk and 1200 Def differentiate Magnarokket from the rest. The trigger QuickEffect is the same. When activated you get to send a monster to the grave. Does it target? Nope. Does it destroy? Nope. So best effect so far? Yep. The only downside is that it’s once per turn. Magnarokket’s other once per turn effect is to replace itself when destroyed with a different rokket from the deck. Excellent effect on a good body makes Magnarokket Dragon score quite well. Next up for Rokkets is the only one given the Ultra Rare treatment in a set, Magnarokket Dragon. Magnarokket Dragon is a Level 4 DARK Dragon with 1800 ATK and 1200 DEF, which are good stats for a Level 4. 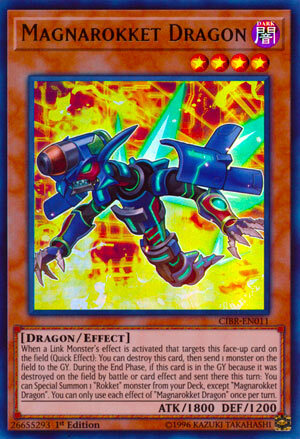 When a Link Monster targets this card (Quick Effect) destroy this card then send 1 monster on the field to the GY. Again, non-targeting and non-destruction removal is great, and it is even better against monsters when many of them have protection against targeting and destruction. Magnarokket Dragon can easily help you get rid of a problematic monster, though Borreload Dragon can bring said monster over to your side of the field and Borrelsword can run over almost any powerful monster, this will help against multiple threats. Magnarokket has the standard Rokket Effect, which I should mention helps with the archetypal draw card, Squib Draw, which lets you destroy a Rokket to draw 2, which helps the deck go plus 1 at the End Phase and see more cards for a Link Play. Quick Launch can also get this from the deck and destroy it during the End Phase for deck thinning or put it on the field to be targeted by a Link Monster, all of that mentioned goes for all the Rokket monsters. Boot Sector Launch can also get Rokkets out of the hand or GY to be targeted as well, so getting Rokkets on the field is easy. I forgot to mention all that the last few days, so I went ahead and did it here for one of the better Rokket Monsters. Art: 4.25/5 The color scheme on this one might be the best. Magnarokket Dragon is definitely the attacker in the group. Stronger than yesterday (but recall, I still grant 1600 is a good attack body on a Level 3 Monster) this Rokket is still a Dark, Dragon, Level 4 again this time, and has 1800 attack, and the 1200 defense isn’t terrible. This review will be a little shorter, as its effect is essentially the opposite of yesterday attached to a higher body of attack. Yesterday, the effect you got (remember, these come from activation of a Link effect that targets this (these) face-up cards) you get to sacrifice this card to send a Monster on the Field to the Graveyard. Also, like yesterday, this can be a Monster you or your opponent controls, which is fun. Just like with Magic or Trap cards, sometimes it’s worthwhile to send a Monster of your own to gain an advantage or effect. Also attached is the Special Summon from the Deck during the End Phase (so long as it’s a different Rokket Monster and as long as the card was sent to the Graveyard during this turn). Magnarokket is good for attacking, and the destruction effect here with Monsters instead of a Magic or Trap card is better for the player too, and more likely to help you out. Art: 5/5 The coolest looking Rokket by far. Love the magna appropriate picture too with the bright yellow/orange and red backdrop. Which supplements the blue and darkness on the Dragon.